The match went down to the last over. 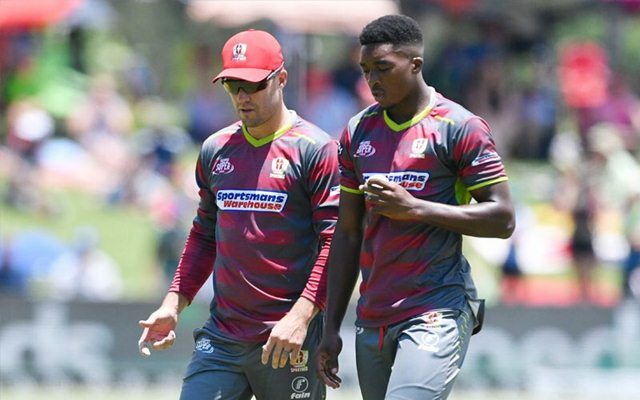 Prior to their match against Paarl Rocks, Tshwane Spartans found themselves in a precarious position in the Mzansi Super League (MSL) with two wins from six matches. The match at SuperSport Park in Centurion turned out to be a closely-fought one, albeit it was high-scoring. In the end, the Spartans, captained by the enigmatic AB de Villiers, won by four wickets. The Rocks won the toss and elected to bat first and the decision severely backfired on them. Both opening batsmen- Aiden Markram and Cameron Delport- were back in the hut. However, skipper Faf du Plessis came out with intent and scored 38 runs from 19 balls with five boundaries and a couple of sixes. Unfortunately, he fell prey to Lutho Sipamla inside the fielding restrictions. In the very next over, leg-spinner Shaun von Berg nipped out Vaughn van Jaarsveld for seven. Former Windies all-round cricketer Dwayne Bravo trod the attacking route and blazed away to 25 runs from 14 balls with three sixes. To the Rocks’ dismay, Sipamla got the better of him with more than 10 overs remaining. The Rocks were eventually bowled out for 121 in 17.4 overs. The run-chase wasn’t expected to pose much of a threat to Tshwane Spartans, but they made a meal of it and were even in danger of losing the match. Wicketkeeper Gihahn Cloete and Dean Elgar put their heads down for an opening stand of 30 runs from five overs. Andrea Agathangelou injected momentum in the innings with a breezy cameo of 23 runs from 14 balls with three fours and a six. Thereafter, the Spartans lost four quick wickets. Chinaman bowler Tabraiz Shamsi came into his own and nipped out de Villiers and England’s limited-overs captain Eoin Morgan for eight and four respectively. At that point in time, the Spartans needed 40 runs from 41 balls. The match went right down to the last over, but Tony de Zorzi and Robbie Frylinck held their nerve to take their team over the line. Numbers tells you a story & also the way he is getting out (too much shots). Finally Tshwane Spartans won today's match ..